I like lounge music. That probably seems a strange thing to point out when reviewing a through-and-through soul record. 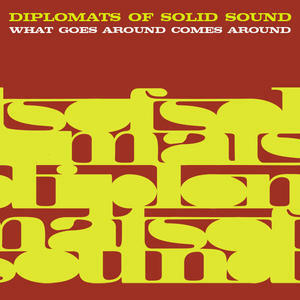 Yet, if you've listened at all to The Diplomats of the Solid Sound over the past decade you will know what I mean. Their brand of soul, funky and loaded with bravado as it is, has a real undercurrent of lounginess. There was certainly no getting around that with their 2001 debut long player, Instrument, Action, Soul, (hell they had a song named after Hugh Hefner for heaven's sake) and while the lounge vibe is definitely more subtle on their latest release, What Goes Around Comes Around, it is still there if you're open to hearing it. What Goes Around Comes Around marks the Iowa heartland band's fifth full-length release. And it doesn't disappoint. 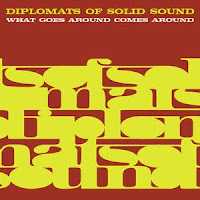 What Goes Around Comes Around seems to invoke all of the great soulful sounds that The Diplomats have used to such great affect over the years, melding them into probably the band's most polished and professional piece to date. And that's saying something. Soullive's Neal Evans. His writing and playing evoke the echoes of Jimmy Smith, Booker T and Stevie Winwood, all the while moving the soulful organ sound ahead in time and space. This is pure soul, with elements of funk and R&B throughout. And yet there's this lounginess thing I can't get past when I listen to it -- and I don't wanna get past it. If you're a fan of the Mod Jazz series of CDs you'll know what I mean. That series trods the line between soulful jazz and lounge jazz, and it's that line that The Diplomats occasionally cross over on this disk. The album oozes with a self-confidence that sets the songs head and shoulders above a lot of the soulful funk and R&B that is being released these days. It's a confidence that isn't arrogant, but rather earned. On "Fascination" Basinger lays down an organ line with a very Jimmy Smith like swagger, while on the groovy instrumental "Bailout!" he let's the horns do the swaggering. "Promise Of A Brand New Day" melds the horns and organ into a cool breeze of sixties soul ease, while laid across the top are the airy vocals of Diplomettes. "Gimme One More Chance" offers up hot rockin' strings even, in a floorshakin' bit of soul that hearkens back to the solid soul ladies of Motown's big hit sixties era. If there are any standouts here then it has be the albums two opening tracks. "B-o-o-g-a-l-o-o" is driven by a sustained organ attack punctuated perfectly with horns, but it's the sassy the vocals, simple as they are that really shake the song up. That's followed by probably the strongest track on the whole album "Back Off" which puts the Diplomettes up front and center where they can take control, and boy do they. When they say back off, you better back off. Overall, this is the Diplomats most solid release, putting all the pieces together. 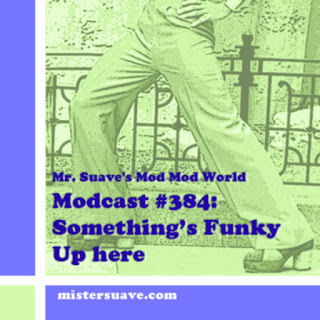 If you like sixties Motown, or 70s soul jazz and funk, or smooth northern soul floorshakers, then you will definitelly get a kick out of this release. my name is Jada I take care of promotion for the label Record Kicks (www.recordkicks.com, home of The Diplomats, among others). I'd like to regularly send you our music for reviews etc on this blog. Drop me a line at jada@recordkicks.net if you're interested!